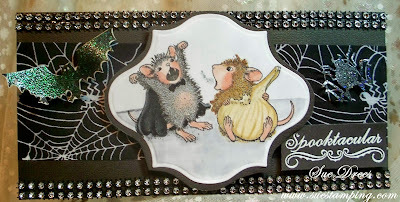 ANY House Mouse, Happy Hopper or Gruffie image or if you enjoy using HM CDs or even decoupage all may be used on your creation with shades of one COLOUR..
Offering a lucky player a $25 Gift Certificate. Our second Sponsor is the fabulous Joanna Sheen Ltd.
Offering a lucky player a $10 Gift Voucher. That's Three Fabulous Prizes and that means Three chances for you to win! So Come on and play along. Please Note; where applicable, all shipping, handling, and tax fees are the winner's responsibility. Bat is cut from designer paper and glittered. a Monochrome entry. Can't wait to see what you come up with. Sue I'm still laughing at your image (hadn't seen it before)and I love the black and white background. Nice job. I also like your signature piece. Hope things are going well in your neck of the woods. Getting a little bit "fall like" here although Wednesday it is going to the mid 80's again. I wish the weather would make up it's mind. Love your image you chose today. Your card is adorable....love the spider web paper! o wow fantastic and great card Sue. That is just fabulous Sue, I love the the design and the colour scheme - perfect for the beautifully coloured sweet image and lots of sparkling!! I LOVE this card!!! Terrifically SPOOKY and wonderful!! 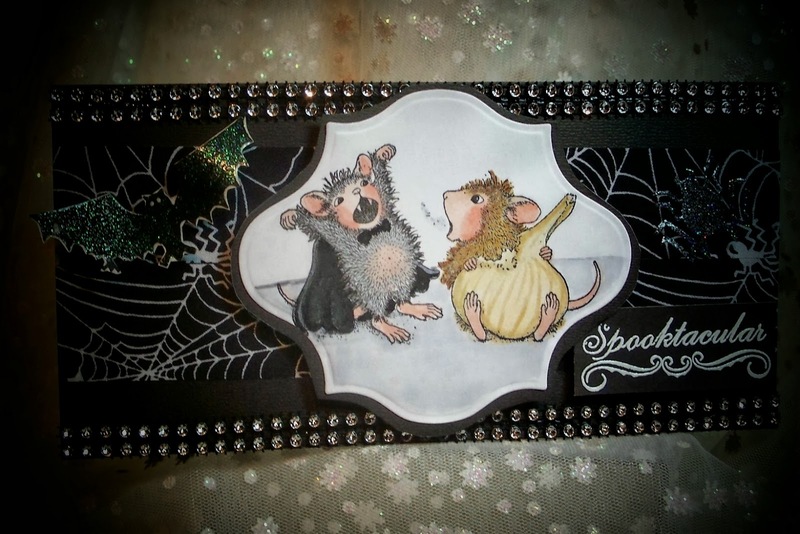 Marvellous image and card, your background spider paper is fabulous and so is the design!